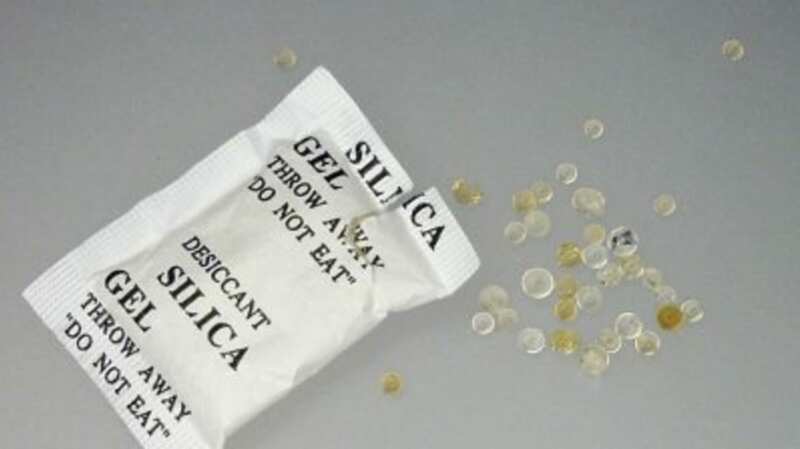 What would happen if you ate one of those silica gel packets? But before we discuss the consequences of ingestion, here's a quick history lesson. Silica gel has been around since at least the 1600s, but was a scientific curiosity until its absorbent properties were put to use during World War I in gas mask canisters. Walter Patrick, a chemistry professor at Johns Hopkins University, patented silica gel in 1919 and joined with Grace Davison, a Maryland-based chemical company, to further develop it. Davison began selling silica gel in 1923 but it didn't take off until World War II. Silica gel can absorb a lot of water—about a third of its weight—without undergoing a chemical reaction or changing shape. Even when they're saturated, the granules stay dry to the touch and can be reused after heating at 250Â Â°F for two hours. These properties make silica gel extremely useful for controlling moisture and humidity, and during the war it was used to keep medicine, military equipment and supplies dry. Today it's packaged with leather products, pepperoni, electronics and vitamin pills and used in museums and libraries to guard against rust, corrosion, tarnishing, mildew, mold and spoilage. If you think about it, silica gel is basically man-made sand. It's non-toxic and chemically non-reactive. People who have eaten anywhere from a few beads to a whole packet have reported no ill effects. If you're curious, it's reportedly almost tasteless, like licking a postage stamp. Why the Skull & Crossbones? Dehydration "“ Silica gel's job is to absorb moisture, and it's going to keep doing that as you digest it. You'd have to eat an awful lot of it to dehydrate yourself, but if you did, it would dry you out in no time. Silicosis "“ This lung disease, also called Grinder's disease and Potter's rot, is caused by inhaling silica dust and causes symptoms like scarring and nodular lesions in the upper lobes of the lungs, shortness of breath, fever, and cyanosis (blue tinted skin). Foreign vapors and toxic additives "“ You don't know what the silica gel was exposed to between Point A and Point B. Eating a packet that came in a box of cockroach traps is definitely not recommended, but the gel could have absorbed other nasty stuff during manufacture or shipping and absorbed it. Sometimes, these things are added intentionally and packaged silica gel might have a bit of fungicide or pesticide added to it. Another additive to watch out for is cobalt(II) chloride, which is toxic. This is added to the gel when a visible indication of absorption is needed. The cobalt(II) chloride makes the granules blue when they're dry and turn pink when they're saturated. And the biggest reason? Lawsuits! "“ Even if the contents of a packet are plain old silica gel with no cobalt(II) chloride, and there's no silica dust present and there aren't enough granules to cause dehydration, companies have been sued over far stupider things. They're just covering their butts. If you've got a burning question that you'd like to see answered here, shoot me an email at flossymatt (at) gmail.com. Twitter users can also make nice with me and ask me questions there. Be sure to give me your name and location (and a link, if you want) so I can give you a little shout out.